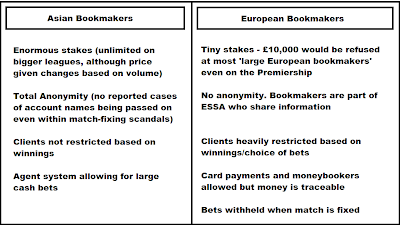 This is a brief illustration of why match-fixers choose Asian bookmakers over European bookmakers. Both now offer Asian Handicap and Totals markets; if anything, the Europeans offer a far greater choice of Special bets such as anytime goalscorer, bookings over/under etc. 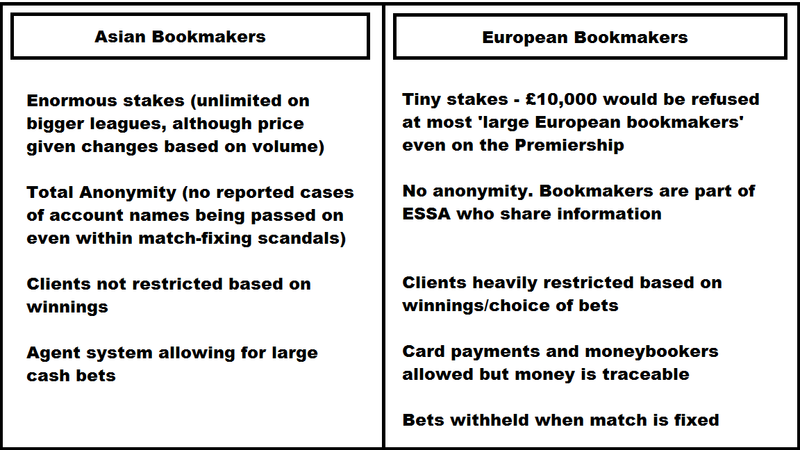 So very simply, in order to combat match-fixing, there needs to be regulation of the bookmakers. People take greater risks in fixing a match if the bets are regulated, recorded and reported on. So why isn't this happening? Asian bookmakers thrive off the anonymity as bettors wash money, match-fix (this information is important) and even just bet illegally. Once they are regulated, it is the European market which will thrive. So Asian bookmakers are somehow ensuring they cannot be regulated. There are ways but they are not being explored. Governments have banned urls (ok more will pop up) for other illegal activity such as filesharing, no matter where they are based. The problem is that the Asian bookmakers are technically legal - it is those betting who are committing the crime. But there are methods of regulation such as huge penalties for not declaring client information or penalties for not showing all records once a match has been fixed. The world is getting smaller and one day cities like Manila and Poipet will be cracked down on because match-fixing has links to bigger crimes. In the meantime, whilst anonymity exists, there is little chance of combating match-fixing. Education alone is not going to do it although we can try.